In a Facebook MUFON group, noted American ufologist Curt Collins posted some questions to me about the 2013 Canadian UFO Survey. He has given me permission to put his questions and my answers in the Ufology Research blog. Most of this is from March 23 to 25, 2014. Curt: I see the witnesses’ data is categorized in several ways, but had a few questions: First, is there an index or subcategory just for sightings where the witness unambiguously reports seeing a flying vehicle? If not, is there any way to extract that? Me: Do you mean a witness seeing a structured object rather than just a light? Curt: Exactly! At least, in their opinion, it absolutely cannot be natural and unlikely to be manmade. Me: The data points or categories for each case were developed originally as a way of quickly coding the textual information available on the report. They were actually developed as far back as the late 1970s, when I was typing UFO data onto keypunch cards (yes, I'm THAT old), which were limited in characters. Back then, I think we were at 80 characters, not 140 like Twitter! We had to decide what information could be easily coded and what information was available for the majority of reports. After sorting through many hundreds of cases, we arrived at the lowest common denominators available from all sources of UFO case data. We used some of the coding of the original UFOCAT and Hynek's classification system. Then I added a few more. When we finally started the Survey in 1989, we had NL and DD, but I added ND (Nocturnal Disc) for nocturnal structured objects that were more than simply lights in the sky. The "Disc" designation is a matter of convenience, since "Daylight Discs" are not discs all the time, either, and could be other shapes. We also include a data point for "shape," so that if a witness sees a structured object that could be called a "craft," it would be a ND. Also, the category of Shape would provide additional info about what was observed. Plus, there's the Comments at the end of the line, where a note about other characteristics of the observed object can be included. The other point is that many witnesses have virtually no ability to discern whether they have seen a structured vehicle or not. A case in point is the term "Orb" which can be used to describe something that is spherical, but also simply to refer to a light without any shape or form. Not to mention the natural ability to "fill in" a black object between three or more lights in the sky, thus creating a "triangle" where there is none. Curt: Good answer about the data sorting―I feel like I've had a backstage tour! I understand about witness reliability problems, but was wondering just what percentage of reports were of Unidentified Flying Vehicles, since the press seems to think that ALL of them are! Me: I use "PS" for "Point Source" to indicate objects that don't have a discernable structure for coding. A huge majority of NLs are PSs. I think most DDs are not point sources, although there are exceptions. Curt: Some researchers feel the "UFO" label is contaminated and use UAP or UAO to distance their work from "flying saucer" silliness. What term to you prefer and why? Me: I think it's important to realize that "UFO" was adopted by the USAF to distinguish it from the silliness to begin with. A number of other terms were proposed over the years, too. My favourite was TOPA, or "Transient Optical Phenomenon of the Atmosphere," proposed by a scientist in a paper. The reality is that even if we start using UAP regularly, the media will still invoke aliens at every opportunity. Also, the public is familiar with “UFO” and even if they assume aliens, at least we don't have to explain as much as if we changed the term. Also, having to explain that “U” means “Unidentified” gives us the opportunity to educate the public and media about what we mean, so I'd still prefer to use UFO. Curt: If you asked a random group to draw two pictures, first one of a UFO and the second of a Flying Saucer, what do you think you'd get? 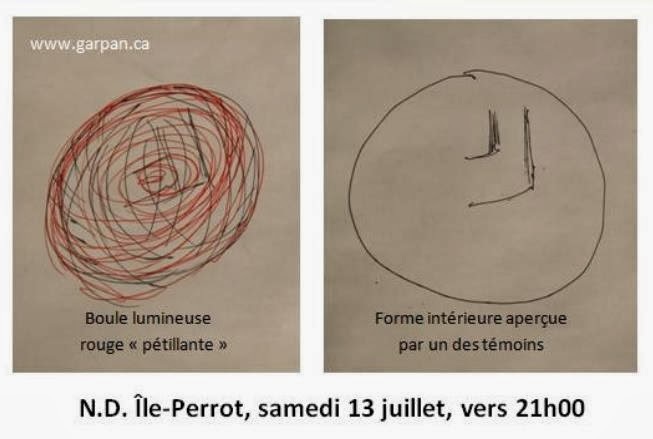 Me: This reminds me of the experiment with UFO abductees done by Stuart Appelle comparing drawings made by non-abductees with those made by "real" abductees. Don Dondieri thought the drawings were totally different, suggesting UFO abductees were real, although some debunkers thought the drawings were similar enough to say imaginary UFO abductions were just as "real." This also reminds me of an experiment I did using drawings made by kids in a grade school many years ago. I had been contacted by parents of two kids and their teacher because the two kids said they had been frightened by a large UFO that flew low over their heads one night while they were playing in the schoolyard. I had permission to talk with the kids, and then because all the other kids in the class were excited about the story, was asked to give a presentation to the entire class about UFOs. I took the opportunity to ask all of the class, including the two who had "really" seen the UFO, to draw a UFO. The result was interesting. The kids all drew fantastic images of aliens and elaborate spacecraft, including some nice artwork of Darth Vader and assorted robots. 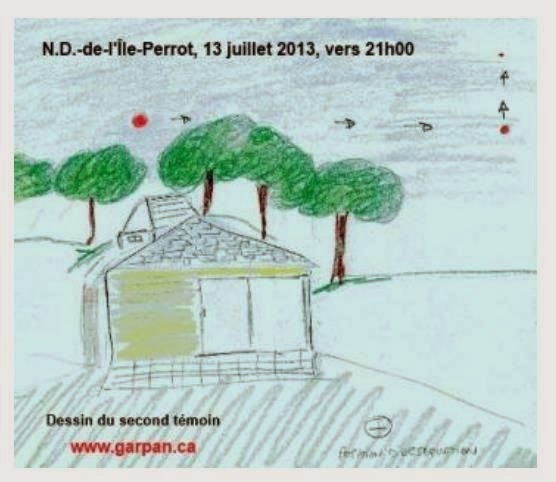 But the two kids who had "really" seen the UFO drew the UFO as they had seen it: a dull grey cigar in a black sky. So my guess would be that asking groups to draw UFOs and flying saucers would result in identical images, although many who were asked to draw a "saucer" would draw a disc. 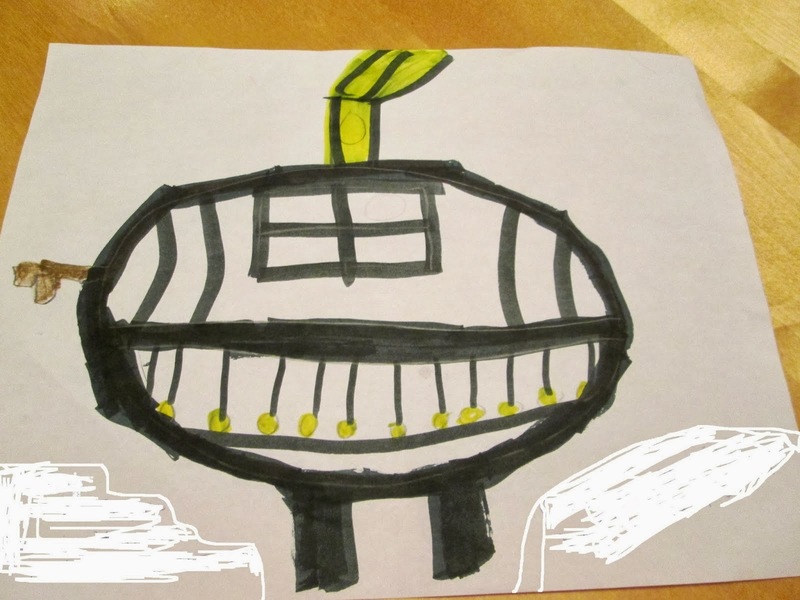 Now, if you asked the two groups to draw an "alien spaceship" and a UFO, they would be identical. Data for the year is available there, as are previous years' Surveys and many charts and graphs. The text is presented below. 2013 marked the 25th year of collecting and analysing Canadian UFO report data by Ufology Research. A 25-year compilation and analyses of a quarter-century of Canadian UFO data is in preparation. · There were 1,180 UFO sightings reported in Canada in 2013, or about three each day. · The number of cases in 2013 is the second-highest number of UFO sightings recorded in Canada during the last 25 years. · The 1,180 UFO cases reported in 2013 is much less than the peak year of 2012, when almost 2,000 reports were recorded. We suspect this was an anomaly, and likely due to many people excited about the so-called “end of the world” in 2012 according to the Mayan Calendar. · In 2013, Ontario had more than 40 per cent of all Canadian UFO reports. · In 2013, about 14 per cent of all UFO reports were classified as unexplained. 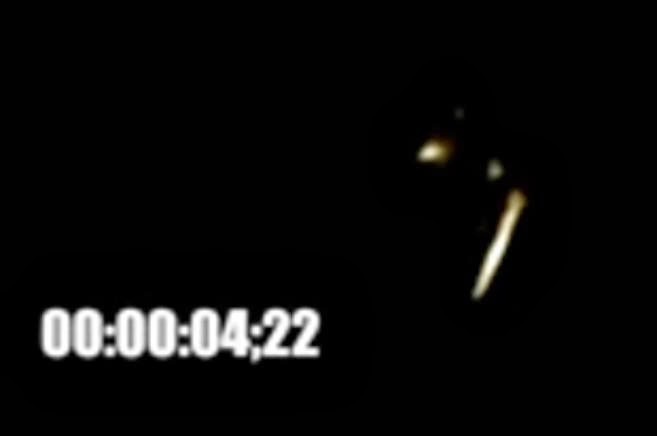 · The typical UFO sighting lasted approximately 13 minutes in 2013. The number of UFO reports per year has varied, although there has been a general trend towards a steady increase in yearly UFO report numbers over 25 years, with spikes in some years such as 1993, 2008 and 2013, when there were almost 2,000 reports in one year. Although there may be a perceived notion that UFOs are not being reported with as much frequency as in the past, this is not true. UFOs have not “gone away.” This data clearly contradicts comments by those who would assert that UFOs are a ‘passing fad’ or that UFO sightings are decreasing. In 2013, Ontario had about 41 per cent of the total number of UFO sightings reported in Canada, the most reports of any province, and exactly the same percentage as in both 2011 and 2012. British Columbia was second, with about 25 per cent of the total. If UFO reporting was simply a factor of population, one would expect percentages of 37 per cent for Ontario and 13 per cent for BC. Monthly breakdowns of reports during each year tend to show slightly different patterns. UFO reports are generally thought to peak in summer and are at minimum in winter, presumably due to the more pleasant observing conditions during the summer months, when more witnesses are outside. In Canada in 2013, July and August numbers were again high, but report numbers were unusually high in January as well. An analysis by report type shows a similar breakdown to that found in previous years. The percentage of cases of a particular type remains roughly constant from year to year, with some variations. Proportionally, Daylight Discs increased significantly in 2013, but most cases still were Nocturnal Lights. Just under two per cent of all reported UFO cases in 2013 were Close Encounters, emphasizing the reality that very few UFO cases involve anything other than distant objects seen in the sky. This is an important statistic, because the current popular interest in abductions and sensational UFO encounters is based not on the vast majority of UFO cases but on the very tiny fraction of cases which fall into the category of close encounters. Speculation on what aliens may or may not be doing in our airspace seems almost completely unconnected to what are actually being reported as UFOs. The average duration of UFO sightings in Canada in 2013 was 13.5 minutes, similar to 2012 when the average duration was about 15 minutes. These significant lengths of time suggest some simple explanations. Previous analyses have shown that long-duration sightings tend to occur in the early morning hours, from about midnight until 6:00 a.m. In cases where colours of an object were reported by witnesses, the most common colour in 2013 was orange, similar to previous years. The next most common colours were red, white and “multi-coloured.” Since most UFOs are nocturnal starlike objects, the abundance of white objects is not surprising. Colours such as red, orange, blue and green often are associated with bolides (fireballs). Orange is most often associated with the observation of a Chinese lanterns, the launching of which became popular during the past few years. The ‘multicoloured’ designation is problematic in that it literally covers a wide range of possibilities. This label has been used, for example, when witnesses described their UFOs as having white, red and green lights. Many of these are certainly stars or planets, which flash a variety of colours when seen low on the horizon. Aircraft also frequently are described as having more than one colour of light, such as flashing coloured wing lights. However, seen from a distance, aircraft will often be visible only as moving white lights. The average number of witnesses per case is approximately 2.00. This value has fluctuated between a high of 2.4 in 1996 to as low as 1.4 in 1990. In 2011, the average number of witnesses per case was 1.74, and the value in 2012 remained about the same, at 1.79. In 2013, the average number of witnesses per sighting was 1.71. Witnesses’ descriptions of the shapes of UFOs vary greatly. In 2013, about 54 per cent were of “point sources”—that is, “starlike” objects or distant lights, about the same as previous years. The classic “flying saucer” or disc-shaped object comprised only around five per cent of all UFO reports in 2013, contrary to popular opinion. Even the “triangle” shape, which some ufologists have suggested has supplanted the classic “saucer,” was only five percent of the total in 2013. The average strangeness rating for UFO reports during 2013 was 3.67, up from the 2012 average of 3.21, where 1 is considered not strange at all and 9 is considered exceptionally unusual. Most UFOs reported are of objects which do not greatly stretch the imagination. Hollywood-style flying saucers are, in reality, relatively uncommon in UFO reports. The overall Strangeness rating of Canadian UFO reports has been sliding slightly over time. The average Reliability rating of Canadian UFO reports in 2013 was 3.8, down significantly from an average of 4.6 in 2012. In most years, there are approximately the same number of higher quality cases as those of low quality. However, in 2013, more reports had minimal information on the witness, little or no investigation and incomplete data or description of the object(s) observed. Higher reliability cases include actual interviews with witnesses, a detailed case investigation, multiple witnesses, supporting documentation and other evidence. Since data for many cases are taken from websites and second-hand postings, or in fact self-postings, there is usually no significant investigation of UFO sightings. Well-investigated cases likely comprise only a small fraction of all UFO data, a fact that makes posted UFO case data have limited value. About 32 per cent of Canadian cases in 2013 were reported to the large organization known as the Mutual UFO Network (MUFON), which has a good online reporting system. Traditionally, the lion’s share of reports used as data came through Sightings.com, which has been relaying UFO cases reported through the former Houston, BC, Centre for UFOs (HBCCUFO), with about 32 per cent in 2010 and 35 per cent in 2011, but up to 45 per cent in 2012 and down to 24 per cent in 2013. The decline in 2013 was due to HBCCUFO scaling down its activity. In 2013, about nine per cent of the total cases were obtained through the private and non-profit National UFO Reporting Center in the USA. Like MUFON, NUFORC has a toll-free telephone number for reporting UFOs and a large sightings list created through voluntary submission of online report forms by witnesses. About five per cent of all UFO sightings reported in 2013 were sent directly to Ufology Research. There were four operative categories in the Canadian UFO Survey: Explained, Insufficient Information, Possible or Probable Explanation, and Unknown (or Unexplained). It is important to note that a classification of Unknown does not imply that an alien spacecraft or mysterious natural phenomenon was observed; no such interpretation can be made with certainty, based solely on the given data. The breakdown by Evaluation for 2013 cases was similar to results from previous years, with the percentage of unexplained cases less than 15 per cent of the total. There were a few slight differences in 2013 compared with previous years; the cases labelled as having Possible or Probable explanations were at a high of 67 per cent, while the cases considered as having Insufficient Information for an explanation were at a low of 17 per cent. Together, however, they comprised a similar percentage of reports as in previous years. The difference in 2013 reflects a subjective evaluation by researchers who question whether a particular report has enough information to consider it as having a possible explanation or if there is simply not enough information to make that judgement. This situation has likely arisen because very few UFO sightings are ever fully investigated, as most are simply reported and published online, often without any follow-up or investigation possible. In 2013, the percentage of Unknowns was 14.5 per cent. There were 172 Unknowns out of 1,180 total cases in 2013. If we look only at the Unknowns with a Strangeness of 6 or greater and a Reliability rating of 6 or greater, we are left with 48 high-quality Unknowns in 2013 (about four per cent of the total). This is in line with previous studies, such as USAF Blue Book, which found three to four per cent of their cases were "excellent" Unknowns. As it is, these 48 Canadian cases in 2013 can be reduced further by eliminating those in which investigation is not complete or details not made available for outside evaluation. The interpretation of the 172 Unknowns in 2013 is that these cases were among the most challenging of all the reports received. It should be noted that most UFO cases go unreported, and that there may be ten times as many UFO sightings that go unreported as those which get reported to public, private or military agencies. Furthermore, it should be noted that some cases with lower reliability ratings suffer only from incomplete investigations, and that they may well be more mysterious than those on the list of Unknowns. And, above all, these cases are not proof of extraterrestrial visitation. 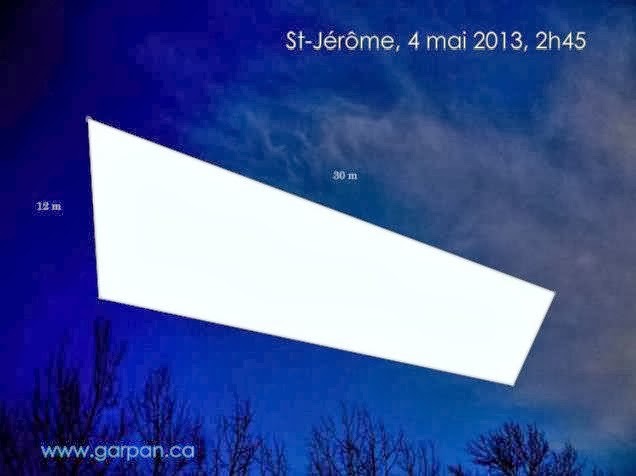 The following are those Canadian UFO reports in 2013 which had a Reliability Rating greater than 6, a Strangeness Rating greater than 6, were also assigned an Evaluation of Unknown, and for which details are available for evaluation. Two children had been sledding on a small hill when they saw a large object coming towards them over the trees. They heard a beeping noise and watched the object shaped like “a massive hotel” with protrusions and windows flew over a nearby house and out of sight. 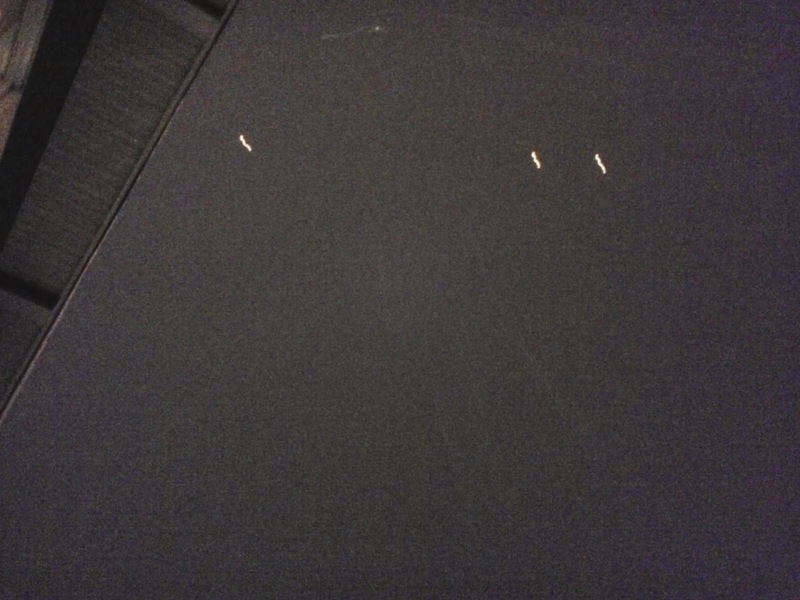 Strange lights were observed south of her house by a witness who took photos with her camera. After about five minutes the lights took off into the sky and then several military helicopters were seen flying in the area. The incident was investigated by police. A witness was on his balcony using his telescope to look at a star when a bright flash lit up his surroundings. He looked up to see a large rectangular object moving over the treetops and making a whistling sound. After a few seconds, it disappeared. A witness saw a red glowing sphere moving horizontally over trees on the horizon, then it moved vertically upwards and disappeared. It seemed to have “a kind of 'structure” and was apparently solid. An air traffic controller saw four lights in a V-shaped formation moving together silently overhead. The witness said the lights were at an altitude of about one or two thousand feet and were heading slowly northwest. Because there was no visible aircraft beacon, the witness did not believe the lights were on an ordinary aircraft. 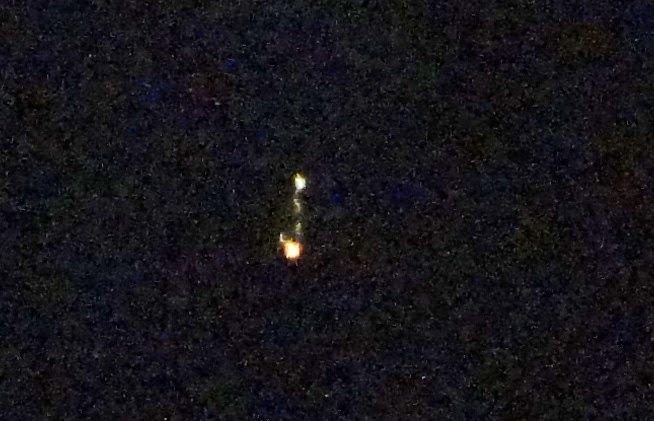 A former helicopter pilot and two other people watched as many as 50 orange lights moving in the southwest sky in pairs following the same trajectory south to north. They watched the procession for at least five minutes. During a snowstorm on February 23, 2013, around 10:00 pm in St-Georges-de-Beauce, PQ, a woman was washing her dishes while looking out her kitchen window. She saw three orange lights coming from afar, and called to her husband to come look with her outside. When the lights passed overhead, she took two photos and then filmed a short video with her phone’s camera. The lights seemed to change shape and were “morphing.” As they watched, another small flashing light joined the three and sped away with them towards the northwest.